Vancouver Island based Cowichan Pasta Company works with local farmers to grow both ancient grains and modern grains for their pasta production which is then milled at True Grain Mill and Bakery. Matt Horn founded the company in 2010 first producing frozen ravioli, later introducing dried pasta using ingredients from BC and many local products such as salt from Vancouver Island Salt Company, Cowichan Valley beef, BC spot prawns, vegetables and foraged items like seaweed and mushrooms when in season. I learned about his delicious pasta from The Fish Counter on Main Street, a shop that I visit often. I have since tried a few of his different dried pasta cooking it up at home with some good olive oil drizzled with some parmesan cheese. 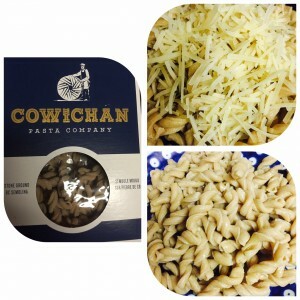 Cowichan Pasta can be found all over the British Columbia from fine foods stores to larger chains. 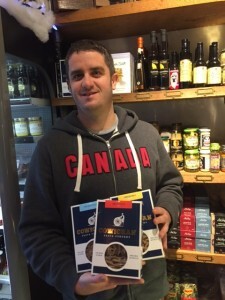 Cowichan Pasta is the first pasta company in Canada making stone ground pasta with ancient grains such as Spelt, Emmer and Red Fife that is stored in whole kernel form, and then milled fresh with a chosen grind that maintains more of the fibre portion of the wheat than over processed grains.